Magnetic Anti-Arthritis Health Gloves - Choose Medium or Large from the from down menu above. - Treat your hurting hands to healing therapeutic warmth and ease pain from arthritis or carpal tunnel syndrome. - The ergonomic 4-way stretch gloves with controlled compression "massages" away pain and reflects heat, increasing circulation to aching hands, fingers and wrists. - Magnets positioned at joint pressure points believed to decrease pain including arthritis. - Magnets are said to increase blood circulation in order to relieve pain and promote healing. 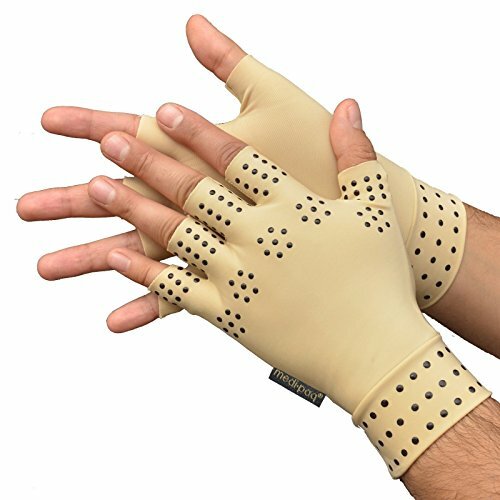 - These gloves feature small, lightweight magnets over the knuckles, fingers and wrists which are designed to help relieve arthritic joint pain. - Breathable Nylon/Lycra Spandex blend. - Fingerless, lightweight design allowing you to continue with your daily activities. - Please choose Medium or Large using the hand size chart above. - Comfortable gloves offer gentle compression and massaging for all day relief.